We are pleased to announce that we are offering $50 off of our already low prices. Keep an eye out for a special $50 gift card that our Prom Representatives are passing out around school. Work with the Valley’s largest and in stock inventory. No appointment necessary, no ordering from a catalog! See your outfit and colors in person today! 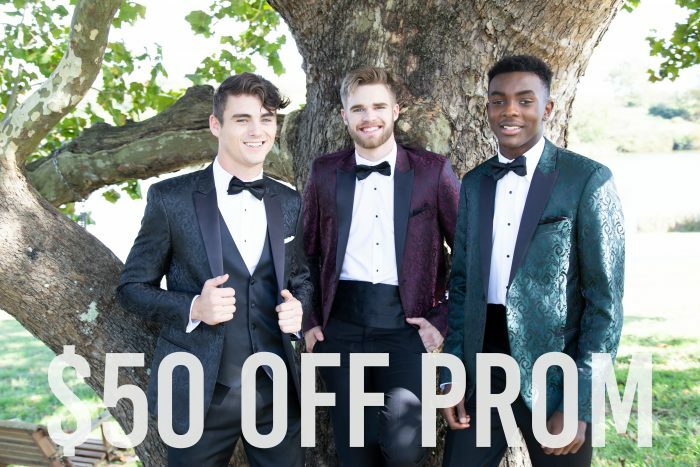 See a tuxedo specialist at Classic Menswear & Tuxedos for more details! Use this card to get a high quality prom tuxedo rental for cheap! More styles, fits, colors, and sizing options than ever! Check out our new Gold, Camo, Tan, Burgundy, Red, Blue, Navy, Grey, White, and Black Slim-Fit tuxedos for prom. Ultra fit tuxedos now available in black, charcoal paisley, blue paisley, and coming soon: green and burgundy paisley.